This standard calculator is a must for any businessman, worker, teacher, student or anybody that needs to make any sort of calculation from time to time. 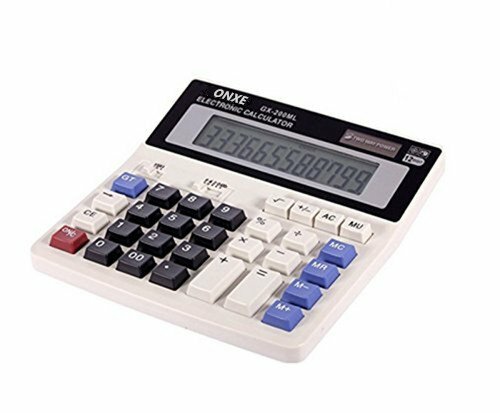 The calculator is made of good quality material and is well constructed. The 12 digit display screen indicates your numbers in clear, dark lettering. Both button battery and 1x AAbattery power ensure that you'll always finish whatever you start, whenever and wherever you are so you don't miss a step. Quick and easy tax calculation.Displays up to 12 digits. Extra-large LCD display. Tilted screen for easy and accurate screen reading.Perfect for office, school or home use. Two-way Power:1 Button Battery and 1 AA batteries (included) two kinds of power supply,Button Battery and 1 AA batteries, long battery life. If you have any questions about this product by ONETWO, contact us by completing and submitting the form below. If you are looking for a specif part number, please include it with your message.